The ionosphere a belt of electrons and electrically charged atoms and molecules out to about 1000km. These were of particular interest to RRE Malvern because the troposphere was to be used by the Army for long distance microwave radio links to Germany. The stratosphere was of interest because of the problem for aircraft with clear air turbulence (CAT) which can cause dangerous flying conditions and the ionosphere was also used by the Army for tactical radio. The composition of the various layers of the ionosphere are subject to enormous variability caused by the differing amounts of radiation received from the sun and its interaction with the nitrogen and oxygen atoms in the atmosphere. Probably the real reason the research was started was Dr Hey’s interest and the expertise available at RRE North site. The dish was hand built entirely in-house using the Engineering department and the North site riggers’ expertise. The dish was 43m (140ft) in diameter and the effective area was found to be 830 m2. 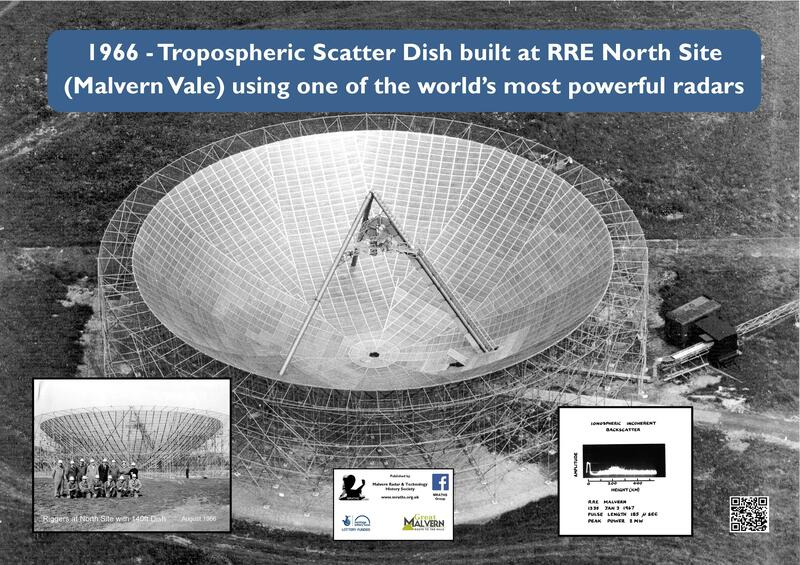 It was fitted with one of the most powerful radars in the world using a huge GEC Klystron “possessed” by Nigel Nicholls to feed the vertically beamed fixed dish and fed by about 100m of 21 waveguide, which was so large people had to clean it by getting inside. Aircraft were not supposed to fly over it because the power of the radar was so great that there was a danger of triggering explosive bolts. Electron densities could be measured up to a height of 1000Km. The measurements were analysed by RREAC, the establishment’s own-built discrete transistor computer and occupied many night time hours of computer time. In December 1966 simultaneous measurements were made by the Malvern dish and the top-side ionosonde carried on the Canadian/US satellite Alouette 2 (1965-98A). Good agreement between the incoherent scatter measurements was obtained. Later work included looking at the detection of high altitude clear air turbulence. Whilst this was successful it was concluded that the transmitter power / receiver sensitivity required was beyond the capability of airborne radars of that period. 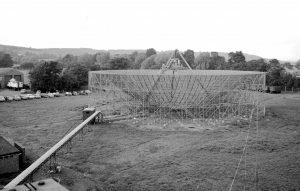 The dish was dismantled in the early 1970s.